Our destination today would take us into the arid province of Rajasthan, but before leaving Delhi we stopped at Qutab Minar to see the beautiful victory tower and mosque. 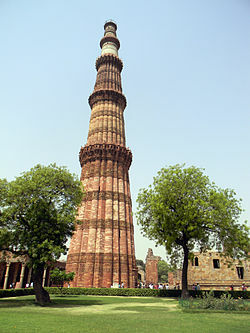 Anna, our tour director, pointed out that while some think of the monument as a victory tower built as a memorial to the Muslim victory in 1193 over the last Hindu kingdom in Delhi, others try to soften history by saying it’s simply a minaret for muezzins to call the faithful to prayer. Either way, it’s the world’s tallest brick minaret, the tallest stone building in India, and a UNESCO World Heritage Site. When I come back I’d like to experience the music and dance of the three-day Qutub Festival. 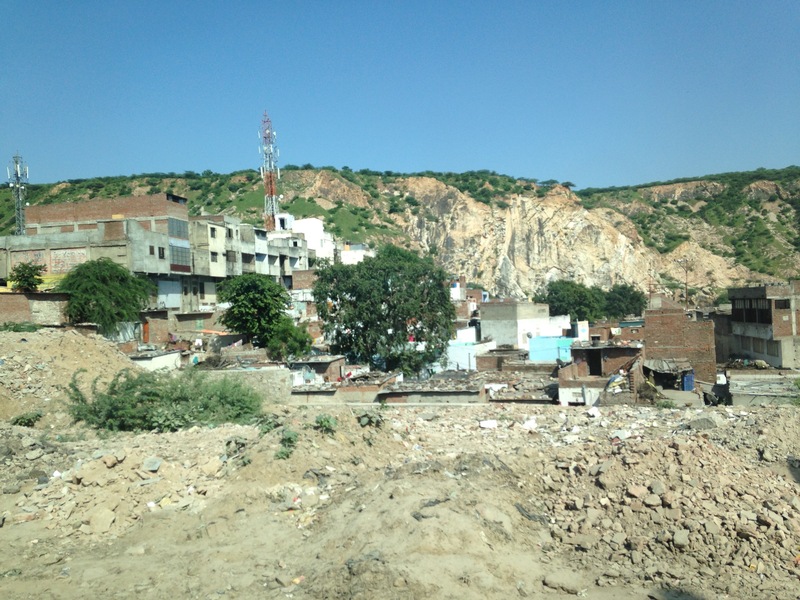 Despite the beauty of the site, the red bricks, and intricate design, a certain melancholy remains attached to it because (according to an onsite inscription) the materials to build the site came from 27 Hindu and Jain temples demolished at the time of the Muslim invasion. 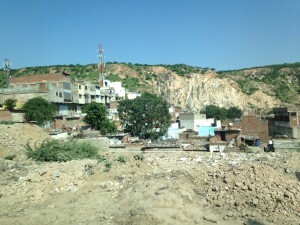 From Delhi into Rajasthan the countryside became increasingly more barren and I wondered what the grazing animals survived on. We’d see dark round pancake shapes all along the side of the road interspersed with little tan-colored mud huts about the size of a doghouse. What was that all about? Anna just grinned and explained that cow dung was an important fuel. Families dried it in the sun on the side of the road and then stored it in the small wattle houses for future use. What would happen to the area, I wondered, if they used some other energy source—solar seems logical–to cook their food and composted the dung to create humus-rich soil that would support crops? Despite the millennia of tradition against such an innovation, the agriculturalist in me longs to see it happen. 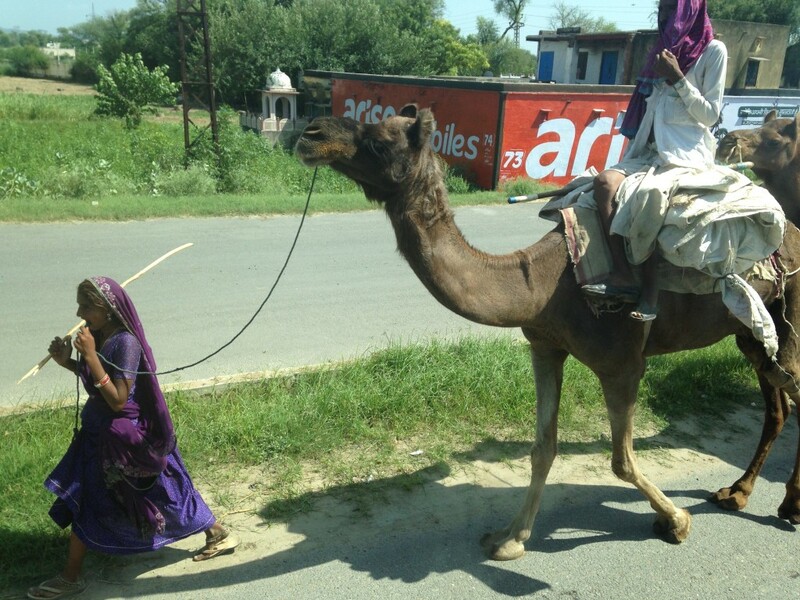 Interspersed with vehicles of all sizes and shapes were gypsy caravans of donkeys and camels and people of all ages. 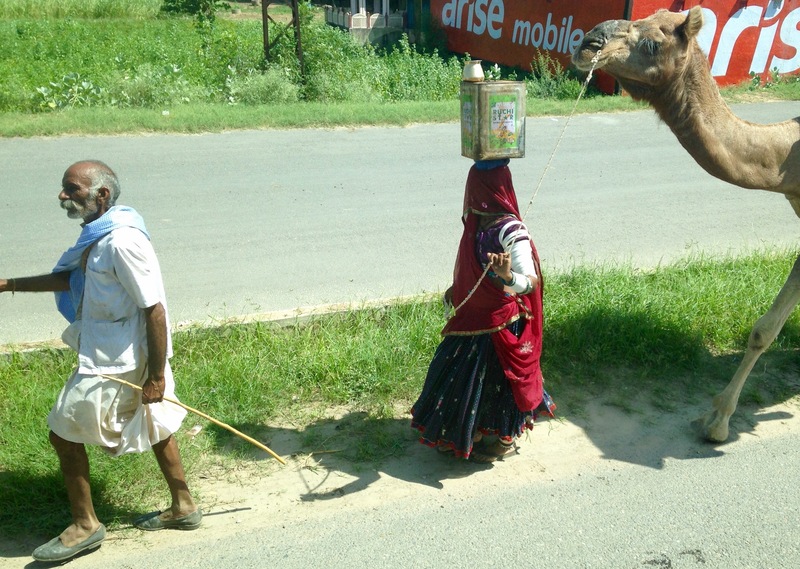 How does this girl carry a jug of something on her head with a drinking cup perched to one side at the same time she’s leading a camel down a busy highway — and all with her face covered?